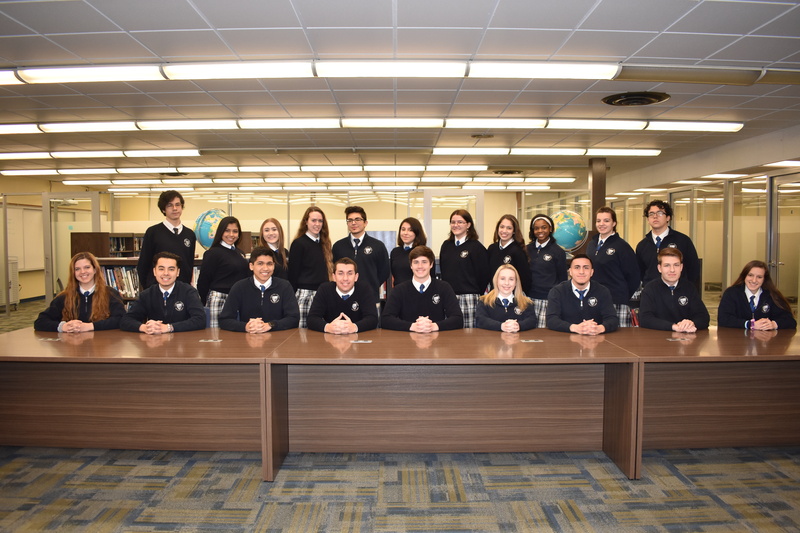 Bishop Noll’s Graduates with Distinction are, in front from left, Elizabeth Buksa, Sebastian Valdes, Brandon Fuentes, Franco Komyatte, Jake Fuehrmeyer, Alexis Fortuna, Arthur Vazquez, Henry Smith and Alexandra Traciak. In back are John Wea, Tatiana Jimenez, Alejandra Wedryk, Julianne Hoff, David Mendoza, Maya Cazares, Rebecca Vazquez, Elysa Roldan, Chyna Davis, Alexis Zieminski and Matthew Avila. Bishop Noll Institute has announced its Graduates with Distinction for the class of 2019. These top academic seniors all earned a 4.0 or above GPA. These grades also determine the valedictorian and salutatorian. Franco Komyatte, of Highland, was named valedictorian. He attended Our Lady of Grace School. Jake Fuehrmeyer, of Schererville, was named salutatorian. He attended St. Mary’s School. The Graduates with Distinction are the following: Matthew Avila, of Chicago, attended Sacred Heart Chicago; Elizabeth Buksa, of Munster, attended St. Thomas More; Maya Cazares, of Highland, attended Our Lady of Grace; Chyna Davis, of Hammond, attended St. John Bosco; Alexis Fortuna, of Griffith, attended St. Mary; Brandon Fuentes, of Hammond, attended Wilbur Wright Middle School; Julianne Hoff, of Calumet City, attended Lincoln Elementary School; Tatiana Jimenez, of Hammond, attended St. John Bosco; David Mendoza, of Hammond, attended St. John Bosco; Elysa Roldan, of East Chicago, attended St. John the Baptist; Henry Smith, of Portage, attended Highland Middle School; Alexandra Traciak, of Hammond, attended St. Casimir; Sebastian Valdes, of Highland, attended St. Stanislaus; Arthur Vazquez, of Hammond, attended St. Mary; Rebecca Vazquez, of Hammond, attended St. Casimir; John Wea, of Hammond, attended St. Casimir; Alejandra Wedryk, of Chicago’s Hegewisch neighborhood, attended Annunciata; Alexis Zieminski, of Calumet City, attended St. Casimir.